The extensive undersea ruins first discovered only late last century off the coast of the southernmost Japanese islands and other nearby islands of Taipei, are accepted by Japanese archaeological researchers to be manmade by an earlier civilization. When or who these people were, is not known to those researchers. The similarity of the undersea ruins, to those on islands nearby, is unmistakable---the similarity to ancient ruins in other parts of the globe is remarkable! The article referenced below points out the striking similarity of the `Yonaguni Monument' to Machu Pichu in Peru. 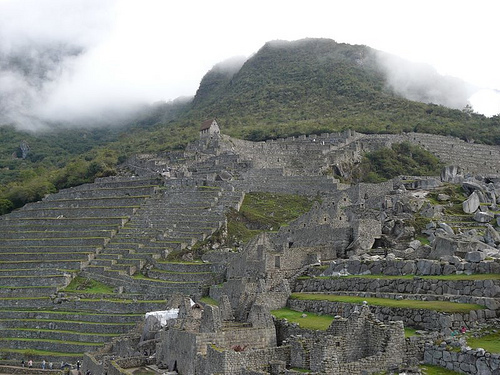 Archaeologists, however, believe that Machu Pichu was constructed by the Incas around 1400 c.e. But the rock plateau of the Yonaguni Monument has to be more than 10,000 years old because its location has not been above sea level since then. Why then would there be such similarities? One reason, I believe, is something the researchers will not realize, unless they know about the submerged continent of Pan, and its geography. 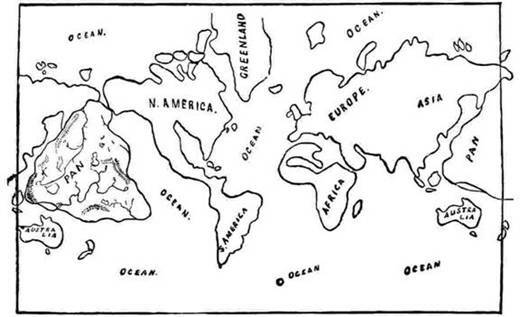 According to the map in Oahspe which shows the locality of Pan in the Pacific Ocean before it was submerged, the west coast of the continent ran parallel to the border of the Asian continent where the Sea of Japan and the East and South China Sea separated the two land masses. When the Continent of Pan was submerged, the mountainous regions along this coastline remained exposed, since the continental crust was cut at the border of the northern mountains. Oahspe; The Lords' First Book; 11/1.55. The fleet of two ships carried to the north was named Yista, which in the Whaga tongue, was Zhaâ€™Pan, which is the same country that to this day is called Japan, signifying, relic of the continent of pan, for it lay to the north, where the land was cleaved in two. 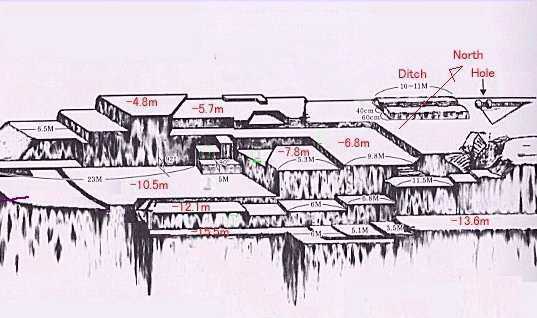 Where high mountainous areas were submerged, south of the Northern Mountains of Pan, (what is now south of the main islands of Japan), the higher areas remained exposed existing as low lying islands surrounded by lower levels not far beneath the surface near the coastlines. Thus the similarities of structures found on the islands with those under the sea nearby. Any of these ancient buildings of Pan would likely have the characteristics that mountain building would require. Machu Picchu in Peru, a stone building complex built on the top of a mountain would also require structural techniques to create stability, involving series of stepped foundations, and so the striking similarity. To the right is a view of Machu Pichu. The similar broad stepped masonry features can be seen in the Yonaguni Monument also. Stories of the Flood Part 1.